Melissa Ricks on daughter Kiera Kelly: "I really want to raise her like my parents raised me. And I really want her to turn out into a really good person. That's my goal talaga na she grows up to be kind and loving person to other people, marespeto." Melissa Ricks is grateful that her two-year-old daughter Kiera Kelly has not thrown any tantrum. “Not yet,” she said in an exclusive interview with PEP.ph (Philippine Entertainment Portal) at the launch of Phillips MOM for moms app. The period gave her the chance to be a hands-on parent, and an influential figure to her daughter. "I was there for a year and four months. I took care of her by myself. I did every thing by myself so I think that’s a big part of me growing up as a person. "Sobrang proud ako sa sarili ko dun. "So pagbalik ko, dun pa kasi hindi pa siya nagsasalita, behaved pa.
"Now, she’s in the terrible twos going on the terrible threes, mas malala pala yung threes." According to parenting websites, the terrible twos is a normal stage where toddlers begin to struggle between their reliance on adults and their desire for independence. Melissa continued, “She’s talking now and ang dami niyang sinasabi and nagdadahilan na. "And then, she’s telling stories, so it’s a whole different phase again. "Pero ang hirap, e, so you really have to balance na 'no you can’t have it, you can only have that if you’ll be good or if you go to school’ or something like that. Most of the time, the toddler listens. 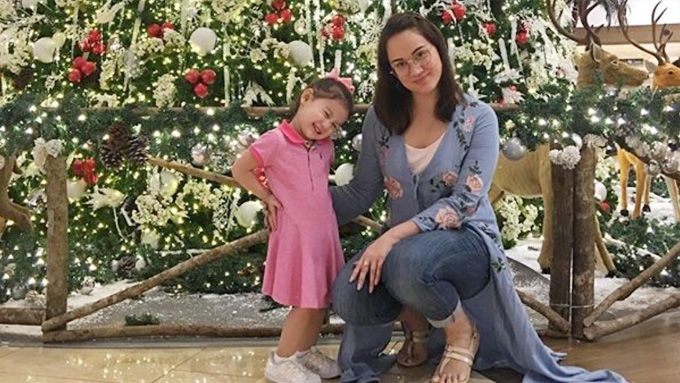 “When I tell her na ‘No, you can’t get that.’ ‘Okay, mommy.’ ‘Pero next time, if you’re a good girl, we’ll get it.’ ‘Okay, mommy.’"
Sometimes, when she has to be firm, it breaks Melissa’s heart to see Kiera cry. But she has learned how to manage her impatience by reminding herself: Kiera is just a kid. “Iniisip ko na lang yung once I was a kid too, and she doesn’t understand what’s going on. "Gusto niya lang mag-play. Ayaw niyang matulog e pagod na ‘ko. Gano’n. It’s part of being a mommy. Motherhood to her is two-way street. "She’s learning, and I’m learning as well so sabay kaming natututo. "Patience lang talaga. Kasi dati, akala ko patient na ako. But it’s something that she has to constantly work on. “It’s really hard. I really don’t know what to do sometimes." JOINING SHOWBIZ? Browsing through her daughter’s Instagram account, the young lady seems to like posing in front of the camera. "Sobrang naaliw ako sa kanya. Mas showbiz pa siya sa ‘kin. “Pinalitan ko yung ilaw ko. Nung pinaandar ko ilaw ko, nag-hosting na siya." Will she let her join showbiz? "Ayoko ng talagang work kasi I’ve seen kids working…I want her to enjoy her childhood. Even when she grows up, the actress will have this condition: "If she finishes school, she wants to do it, that’s fine with me. Siyempre alam ko yung paghihirap ng pag-aartista, di ba…"